Hinrichs, 50, a native of Columbus, Ohio, ascended Ford's ranks through manufacturing jobs. DETROIT -- In 17 years at Ford Motor Co., Joe Hinrichs has gone from overseeing blue-collar workers to leading all manufacturing and product operations globally for the Blue Oval. Hinrichs, 50, head of the Americas, on Monday was named Ford executive vice president and president, Global Operations. The appointment -- effective June 1 -- is part of a massive restructuring of the Dearborn automaker's executive management that included replacing CEO Mark Fields with Jim Hackett, who most recently headed Ford's mobility efforts. Hackett is best known for reshaping Michigan-based office furniture maker Steelcase. 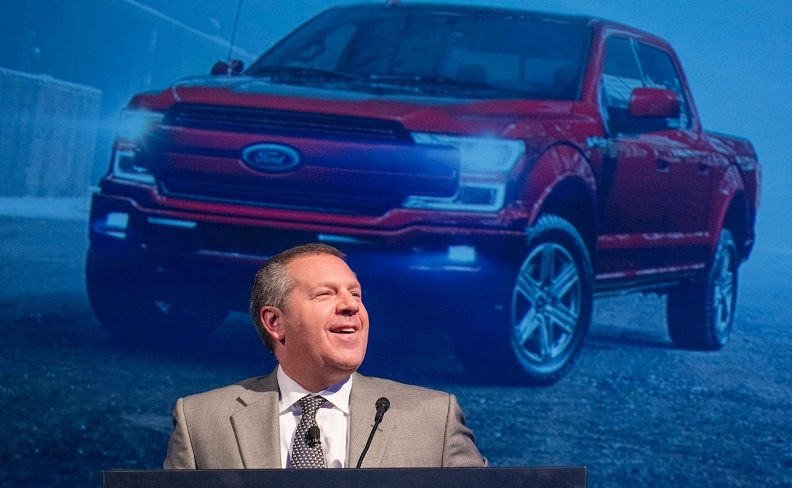 Hinrichs, who was a short-list candidate to succeed CEO Alan Mulally before Fields' appointment in 2014, is one of three Ford veterans to be named as Hackett's top lieutenants. The other two are Jim Farley, head of Ford of Europe, Middle East and Africa, who was named executive vice president and president, Global Markets; and Marcy Klevorn, head of Ford IT and global data, who becomes executive vice president and president, Mobility. Hackett, 62, called the team "walking encyclopedias about the nature of the automotive business" during a Monday news conference announcing his appointment at Ford's world headquarters. "Joe Hinrichs has had a lot of experience running North America, and he's working with us in a visionary way about the evolution of operations," Hackett said, adding that more executive appointments will be made later this week. Hinrichs, a native of Columbus, Ohio, ascended Ford's ranks through manufacturing jobs, beginning in 2000 as plant manager of the Van Dyke Transmission Plant in metro Detroit. He is well-respected among rank-and-file workers and is often seen shaking hands and talking with workers at factory events. Before becoming head of the Americas in December 2012, Hinrichs held several manufacturing positions and led Ford operations in Asia-Pacific, Africa and Canada. Hinrichs served as group vice president and president of Asia-Pacific and Africa beginning in December 2009. He led Ford's Asia-Pacific growth plan, overseeing the construction of nine manufacturing plants and spearheading a commitment to bring more than 50 new vehicles and powertrains to the region by mid-decade. Hinrichs was also chairman and CEO of Ford China from November 2010 to December 2011. From September 2006 to December 2007, Hinrichs was vice president, North America manufacturing. From October 2005 to September 2006, he was vice president of vehicle operations, responsible for 19 assembly plants and eight stamping and tool-and-die plants in Canada, Mexico and the U.S. Before that, Hinrichs served as president and CEO of Ford Canada. Before joining Ford, Hinrichs was a partner and senior vice president of Ryan Enterprises Group, a manufacturing investment group in Chicago. Early in his career, he spent 10 years at General Motors in various positions in engineering and manufacturing, including plant manager. Hinrichs earned a bachelor's degree in electrical engineering from the University of Dayton in Ohio in 1989 and an MBA from Harvard University in 1994 as a GM fellow.